One of our client favorites is TENA® Adult Briefs. TENA® Adult Briefs are designed for those individuals that experience moderate to heavy bladder and/or bowel incontinence. TENA® Adult Briefs have hook fasteners and wetness indicators that make diaper changes easy and feature unlimited refastenability so you can check the indicator if you need to change and then refasten. This is particularly helpful when family members are caring for a loved one who is confined to bed. TENA® Adult Briefs also have a InstaDri Skin-Caring System utilizing Super-Absorbent micro-beads that capture leakage and improve surface dryness which results in healthier, less irritated skin. Some other helpful features of TENA® Adult Briefs include a soft, non-woven back-sheet that creates a less noisy, more dignified, and most importantly, comfortable experience for the user. 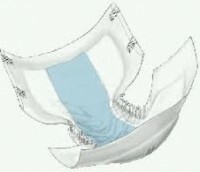 One of the embarrassing features of many adult briefs or incontinence products is the rattle of plastic with movement. It is like broadcasting to everyone around that you are wearing some sort of diaper. The design by TENA® eliminates that problem and enables the incontinent person to mix and mingle in a crowd without restraint. Also, TENA® Adult Briefs have curved elastics around the legs to provide a better fitting product with a reduced possibility of leakage. Also, odor control is built into every garment. This is an invaluable aspect for anyone experiencing the humiliation of the loss of bodily function in public. All TENA® Adult Briefs are Latex-free. 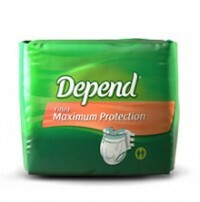 Depend® Protection with Tabs is designed with six EasyGrip™ tabs for discreet open changing. This absorbent garment features a wetness indicator line so you know when it’s time to change, and has additional side leakage protection built-in. Underwear with Maximum absorbency designed for discreet changing without having to remove your pants and shoes – at home or on the go. Adjustable Underwear features perforated sides that neatly tear open with four pre-fastened tabs to securely close for a snug, underwear-like fit. Offers worry-free odor control. 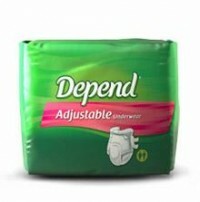 Our adult diapers are perfectly fitted for both men and women. 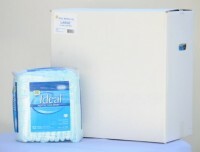 Ideal Brands briefs are fit for all types of incontinence, usually caused by aging, stress or urge. The ULTRA Series brief line provides high level of absorbency, dryness and comfort with added extra Super Absorbent material, added extra fluff. The Ultra brief line is designed with Frontal Tape with a larger tape landing zone and Leg Gathers.